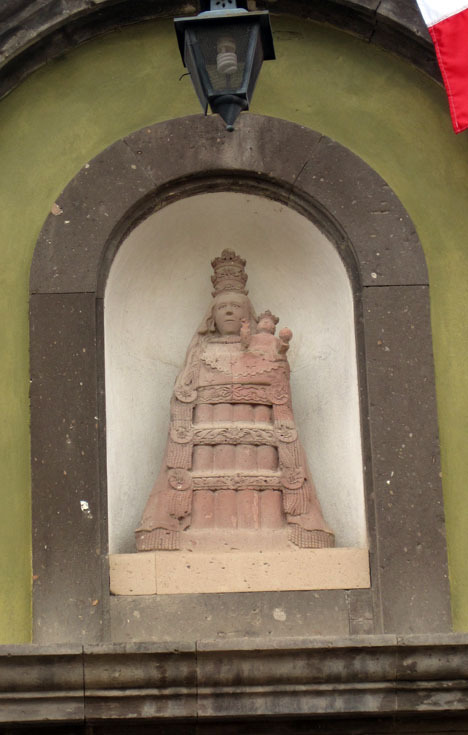 Our Lady of Loreto is an image of Mary that graces the city from many niches and doors. Dressed in a wide dress, in the shape of a fan, Mary holds the baby Jesus. Mary’s dress features grapes and wheat depicting the Eucharist. 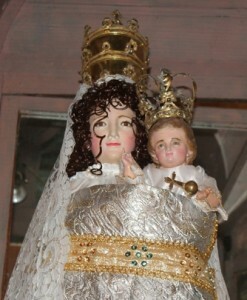 Her towering crown depicts the power of the Church. A flowery cape covers the arms holding Jesus who carries a sphere with a cross in his left hand (meaning he rules the world) while his right hand gives a blessing. This image was appointed Grand Patroness of San Miguel in Sept. 8, 1736 with September 8th being Mary’s birthday. In 1810 the festival of the Lady of Loreto was celebrated with the local heroes of the revolution against Spain days before the rebellion started. Allende, and the others, placed great faith in the power of Mary and the festival contained parades of various groups (military, women, youth choirs, etc.) with the statue of Mary that now resides permanently in her chapel in the Oratorio. The home Mary was born and raised in, where the angel Gabriel flew in a window to visit her mother, and where Jesus was raised until he was 30, is believed to have been moved by Mary and angels from Nazareth to Loreto, Italy in 1291. Hence, the Lady of Loreto is the patroness of air travelers and is missing her arms from the exhausting journey. A recreation of this holy house was constructed in the Oratorio by the Canal family. The sole difference being the home here only has three walls to show how God’s house is open to everyone. The La Ermita church, located by the Mirador on the road to Queterro, was built in 1736 to honor the Lady of Loreto as travelers then entered, or left, the city. Also built by the Canal family, La Ermita church was also constructed to be near neighboring relatives’ homes and was a favored church frequented by the Otomi tribes. The same native and self-taught architect that designed the Parroquia designed the chapel which lacks a statue or image of Mary. 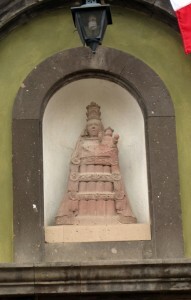 Instead a column in the portico contains attributes of the Immaculate Conception carved in Spain in 1716 and imported to San Miguel. Celebrations start on August 29th (nine days prior) and continue on the street named Loreto featuring food, fireworks, dancers and many mechanical rides for small children. Near the Calazada de la Luz intersection with Lareto is a lovely altar honoring the Virgin Mary each year. Originally this festival was celebrated by the Spanish families living on Lareto, but is now open to all. The money generated from this festival later funds the activities for the following year’s Holy Week’s Good Friday. Eight days following, celebrations continue at La Ermita church featuring a huge fireworks display in the jardin.